England ended a disappointing Women's World Cup campaign with a four-wicket victory over New Zealand in the third-place play-off in Mumbai. 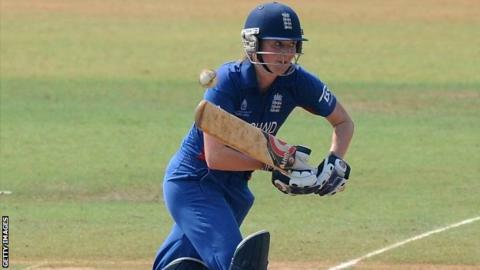 Captain Charlotte Edwards hit an unbeaten 106 from 121 balls, becoming the first woman to pass 5,000 runs in one-day internationals, as England reached their target of 221 with three overs to spare. Earlier, the Kiwis had been restricted to 220-8 despite 85 from Amy Satterthwaite, with left-arm spinner Holly Colvin taking 3-31. The comfortable victory over the White Fearns, England's second in three days, vindicated the view of Edwards and coach Mark Lane that England have played their best cricket too late in this tournament. "Everyone knows England wanted to reach the final, but it was important to leave this tournament with a win so they can come back with some momentum. By going home and working on things, hopefully they can get back to their best against Australia later in the summer." The defending champions learned they had been knocked out in the early stages of Wednesday's 15-run Super Six win over Suzie Bates' side after West Indies beat Australia to book a repeat meeting in Sunday's final. Following the exit, Edwards said that earlier errors had cost her side, with the defeats against Sri Lanka and Australia ultimately proving decisive. But this was a dominant display, with the skipper leading from the front with the bat after the bowlers had done a good job of containing the Kiwis on a flat wicket. Regularly cutting through the off side and working off her pads when the New Zealand bowlers got too straight, Edwards notched her eighth ODI century and fourth in World Cups. She shared a second-wicket stand of 78 with Sarah Taylor, who again showed glimpses of her class before impatiently hitting a Lucy Doolan full toss to short mid-wicket when on 27. Edwards then combined to add 53 with Lydia Greenway and 58 with Arran Brindle, who accelerated England towards their target before tamely patting Doolan to cover for 27. That started a wobble that saw England lose three wickets for three runs, but Edwards stood firm, reaching three figures with a pull off Lea Tahuhu then watching on as Laura Marsh swept Doolan for the winning runs. The ease of England's chase highlighted the good work done by the bowling attack, who, just as on Wednesday, were without the ill Anya Shrubsole. Off-spinner Danielle Hazell came into the side and was tidy for her 1-42, while Jenny Gunn stepped up to take the new ball and responded by having Bates - the tournament's highest runscorer - caught a point. However, after Frances Mackay was bowled playing across the line to Brindle for 30, it was Satterthwaite, scorer of a century in the last meeting between the two sides, who again proved to be the mainstay of the New Zealand innings. Time and again the left-hander shovelled England's spinners through the leg side, steadying the Kiwis after they slipped to 99-4. She added 59 with Katie Perkins, who was well stumped by Taylor off Hazell, and looked set to reach three figures after being put down by Edwards and surviving the tightest of run out decisions from a Heather Knight direct hit. But Satterthwaite was denied when she was bowled round her legs by Colvin, the second wicket in as many balls for the reliable left-arm spinner. At that point, New Zealand looked to have lost their way, but they were boosted by Doolan and Nicola Browne, who took 35 runs from the final three overs as England strangely opted against recalling the economical Gunn to the attack. Still, the White Fearns looked at least 20 runs short of a par total, with England and Edwards proving as much.